Ontech Systems provides efficient, reliable IT support services to Milwaukee based businesses as well as the surrounding Greater Milwaukee area. Seeking IT Support for Your Milwaukee Area business? For over 10 years, Ontech Systems, Inc. has provided IT support to Milwaukee businesses in a number of industries – from law firms to small businesses, local government and beyond. For nearly a decade now, we have maintained 98% of our clients – one of the highest client retention rates in our industry. Ontech Systems provides comprehensive technical solutions for small and medium sized-businesses that drive costs down and bring productivity up. We offer the flexibility to work in tandem with your existing in-house IT staff or act as your outsourced IT support department. 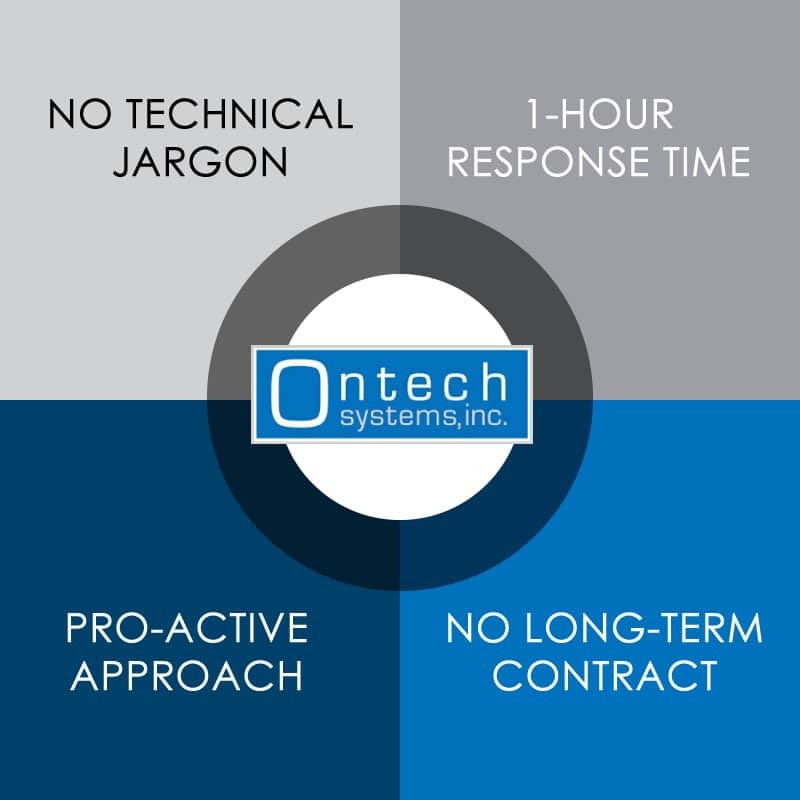 Customers frequently share stories about unpleasant experiences with response time, reliability and trust, while working with other Milwaukee IT companies before finding Ontech Systems. Each of our technicians takes great pride in their ability to communicate effectively and consistently, with various users throughout your network. We understand down time translates into a decrease in employee production and profit loss for many businesses. For that reason, we offer a superior service guarantee to each of our clients, no matter how big or small. No Technical Jargon – Our techs speak a language you can understand. You’ll always know what we’re doing and why we’re doing it. 1 Hour Response Time – No more waiting weeks to hear back from your Milwaukee IT support provider. Unlike many IT providers, we return phone calls or emails within an hour during normal business hours. Pro-active Approach – We evaluate your overall goals and long term growth. We’re not a break/fix firm. No Long Term Contract – For over 10 years, we’ve maintained 98% of our clients without requiring a long-term contract. Our IT support speaks for itself – if you’re not happy with our services, just let us know. We invite you to contact us by email or request a no-obligation, free network discovery where we will evaluate your existing network and offer ways to improve the productivity and efficiency of your Milwaukee business. Our network consultant will first audit your network, infrastructure, server(s), PC’s, backup, and security performance and then sit down with you during a question and answer session to provide the details of our findings. Schedule a free network discovery with one of our Milwaukee IT support specialists today or call (262) 522-8560 with questions.